KFC's take on Nashville-style Hot Chicken is set to arrive on January 18, 2016 nationwide. The new menu item was tested last year in the Pittsburgh area and is hailed by the fried chicken chain as "the most successful product testing in the company’s recent history." Hot Chicken is a fried chicken dish native to Nashville but has recently been spreading its wings (so to speak) beyond the area and can be found here and there in several states (including at least one spot here in Southern California). What sets it apart from regular fried chicken is that it's basted in a spicy sauce featuring cayenne, paprika, and either lard or frying oil (No word yet on what's in KFC's version of the sauce). KFC's version uses their Extra Crispy fried chicken or Extra Crispy tenders as a base that is glazed with KFC Nashville Hot sauce and garnished with pickles. KFC describes it as "the perfect combination of spicy, smoky and crispy. 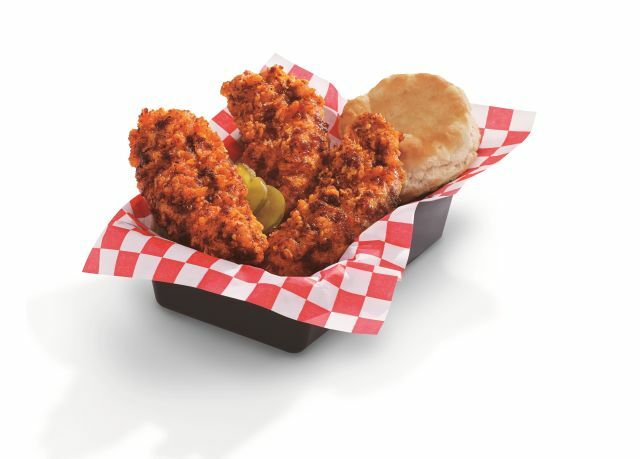 KFC's Nashville Hot Chicken arrives just in time for tailgate season and will be offered in a tailgate platter of 24 tenders for a suggested price of $29.99 (may vary). The chicken will also be available in a individual "basket" meal with either one breast, a drumstick & thigh, or three tenders plus coleslaw and a biscuit starting at $5.49. An 8-piece or 12 tenders meal with a large serving of mashed potatoes and gravy, large coleslaw, and four biscuits will go for a suggested price of $21.99.